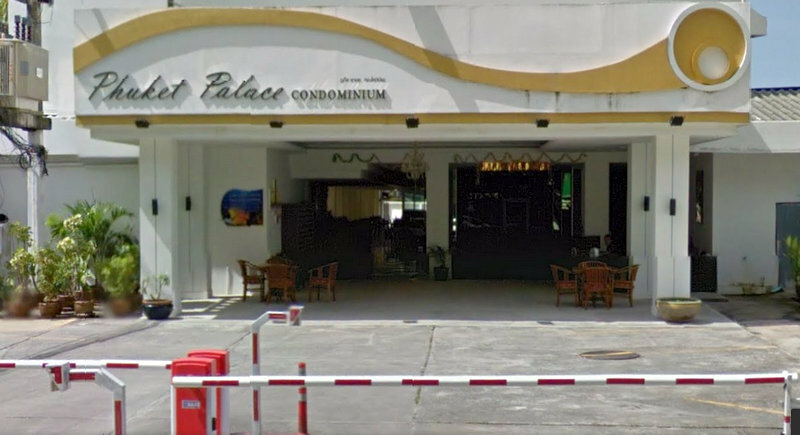 PHUKET: Owners of units at the Phuket Palace condominium development in Patong have been warned that they must be issued work permits in order to legally rent out their units. The warning was delivered by a notice posted inside the Patong Palace condominium building, at the southern end of Patong, earlier this week. The notice warned that units owned by foreigners under the 'foreign quota' could not be used as a source of income. The warning was delivered by a notice posted inside the condo building, at the southern end of Patong, earlier this week. “The notice is live on the noticeboard in reception and has been sent out to all owners. 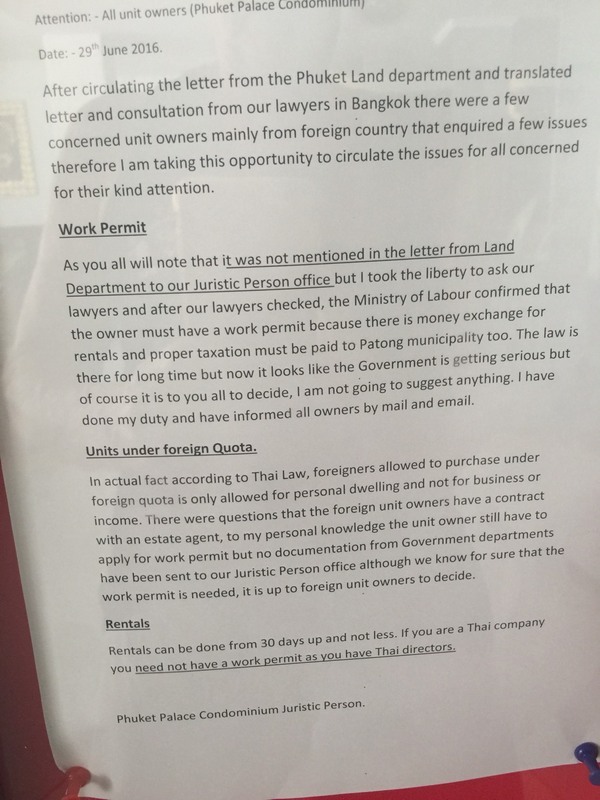 The notice states that any foreign owner who is renting his/her unit must by law obtain a work permit, even if the person uses a real estate broker, they still have to get a work permit,” one tenant told The Phuket News. The notice also pointed out concerns for owners of units under the “foreign quota” – the number of units foreigners are allowed to own within condo developments in Thailand. 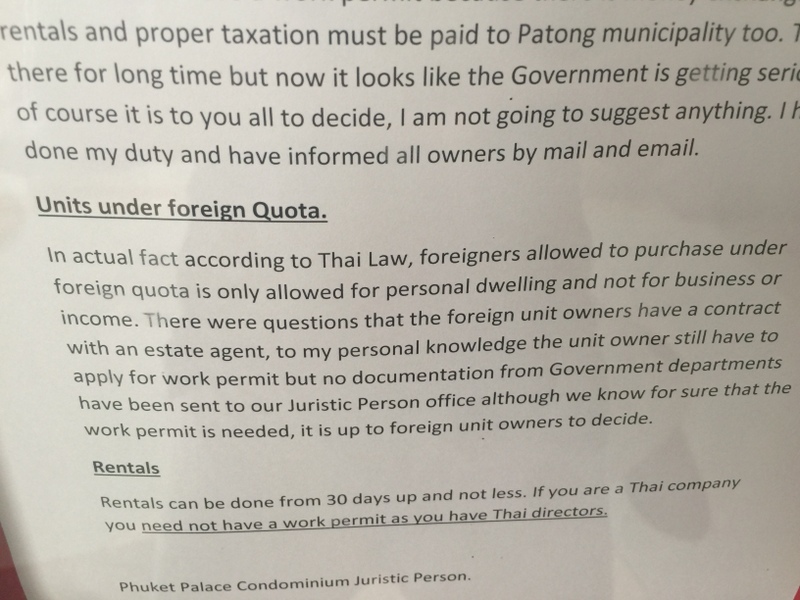 “In actual fact, according to Thai Law, foreigners allowed to purchase under foreign quota is only allowed for personal dwelling and not for business or income,” the notice read. “There were questions that the foreign unit owners have a contract with an estate agent, to my personal knowledge the unit owner still have to apply for a work permit but no documentation from Government departments have been sent to our Juristic Person office although we know for sure that the work permit is needed, it is up to foreign unit owners to decide,” the notice continued. 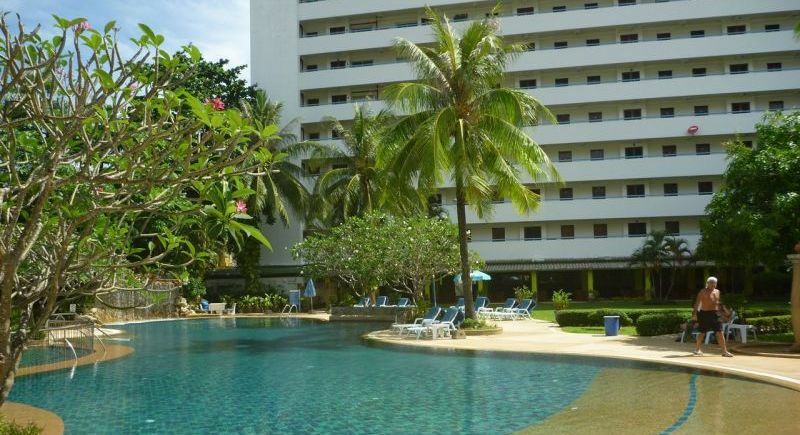 The notice was marked as issued by the “Phuket Palace Condominium Juristic Person”. For decades Phuket palace administration was renting out apts for the owners, who were elsewhere. Owners who were in their respective countries, paid administration fees for work done by Phuket Palace administration, well known by thai authorities! So, that work permit thing holds no ground. Many owners of apts in Phuket Palace can proof that. I am now of the opinion Thai authorities  want to generate complaints, not to improve anything  but to use as opportunities to  line their pockets. Pinot: Really? 3-4000 new condos? My mouth is falling open. How would the occupants/renters travel after 6 pm, when the pre historic lorries transferred into wooden bench smoke/fume blasting 'busses' stop their irregular service? Pinot...I wish you would have told me that before...lol. I just bought 4 of them. But then again my decision to fork out large sums of money was based on extensive due diligence, not on the say so of a market stall vendor or fortune teller. I hope enforcement of the laws has serious impact on the developers building thousands of new condos in Kamala alone. 3-4000 new condos about to hit an already moribund market. 3-4000 completely unneeded and unwanted new condos are an environmental disaster. I don't even have to write it anymore..."DON"T BUY PROPERTY IN PHUKET." Rent. Yes Ericdekegel: I agree with you. Point to consider is: rent out 31 days, and all is legal even when the guest stay just 28 or 29 days? Than you have a nice 2 days for cleaning, preparing for next guests. Right? Put it right on the paper, than it's ok for thai. Is Phuket Palace Condominium run by those (deleted) at CBRE Thailand by any chance? Ben..."It appears that Phuket Palace Condominium Juristic Person have got a little bit confused about a foreigner providing labour and a foreigner having income in the Kingdom of Thailand." If i already have a workpermit from my private business in export here in Phuket. Yes, Ben Smith. I agree with you. Is it not funny that the Phuket palace publication is just signed by: Phuket Palace Condominium Juristic Person? Who is that person? Is it a lawyer? Why he didn't undersign with his name? He doesn't like to stand for his published statement? This makes sense - renting a property is the conduct of business. It would seem that both a business license and a work permit should be required. Are they getting totally crazy in Thailand. Why not kick out all the foreigners and become as second North Korea. Seen the photos, this  notice is not a Government directive/warning. In it selves, it is here and there contradictive and not fully according the thai law. 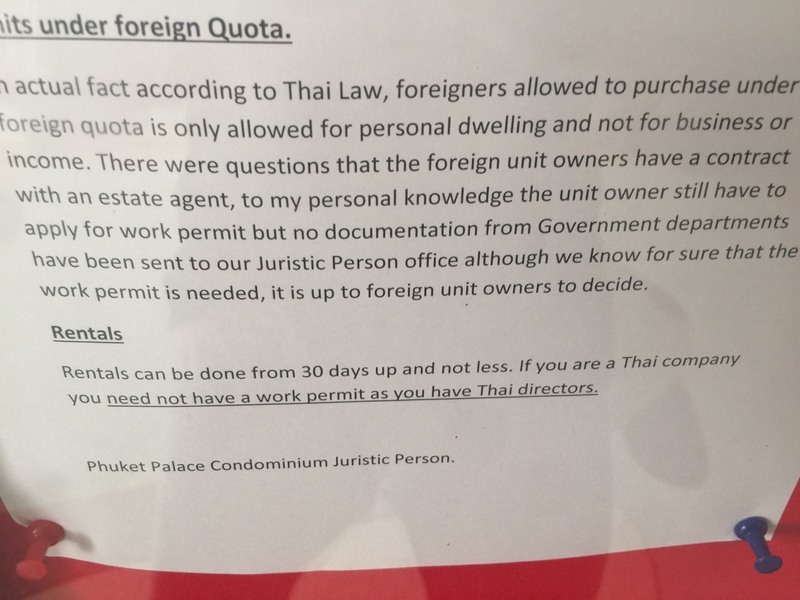 It appears that Phuket Palace Condominium Juristic Person have got a little bit confused about a foreigner providing labour and a foreigner having income in the Kingdom of Thailand. Where a foreigner has Thai income but does not work to generate that income does not require a work permit as far as I know. Obviously the income should be reported to the tax authority as required by law. This is NOT created by government no TM NR on the paper and NO  stamp of some kind, false false and false again.Take it to the police and report the case and those who wright this.